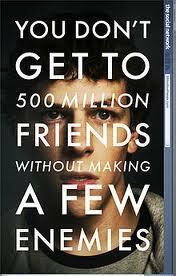 Review: Mark Zuckerberg who is only a student creates Facebook but ends up being sued by these two brothers who say that he stole their idea. Later on the co-founder ends up being pushed out of the business. Really good film. The only thing is that everyone in it talks really fast so you have got to concentrate quite hard on what they are saying. This film won 3 awards in 2011 at the Oscars they were Best Film Editing, The Best Music (Original Score) and for Writing (Adapted Screenplay).